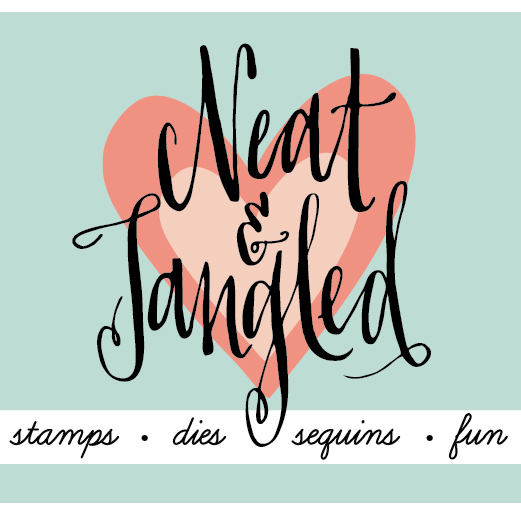 Today is the August Blog Hop for Your Next Stamp! Your Next Stamp is turning 8 this month, and that makes this hop very special. There are bigger prizes and more games increase your chances to win! The August release is HUGE! And I love it all! If I had to pick a favorite, it would have to be the new Silly Birthday Monsters Stamp Set with coordinating dies. To check out all of this month's release (CLICK HERE!) to go to the Your Next Stamp Online Store. First comment for your chance to win an $80 gift certificate to the Your Next Stamp Online Store. The more you comment along the hop, the greater your chances of winning. You do not have to comment on every blog to win, but it increases your chances. The winners will be announced on the YNS blog on 8/10. Also, there is a Party Game! You are challenged to count the number of Your Next Stamp Gumdrops used on all of the projects along the hop. 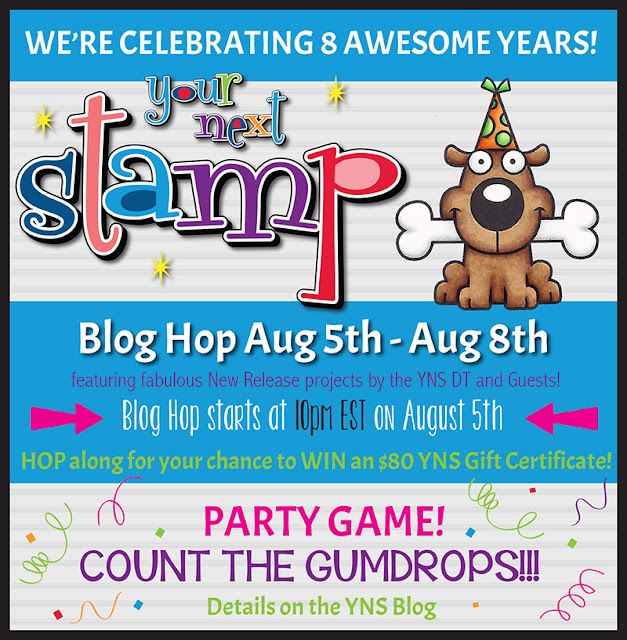 Enter your count in the special Party Game inlinks on the Your Next stamp blog at the end of the hop. The Design Team has a ton of projects to share with you along the hop. I hope you take the chance to see everyone's creations. Your Next Stamp is running a special for this months birthday celebration, stop by the your next stamp store and use the code below for your 20% discount! I have two projects for you today. 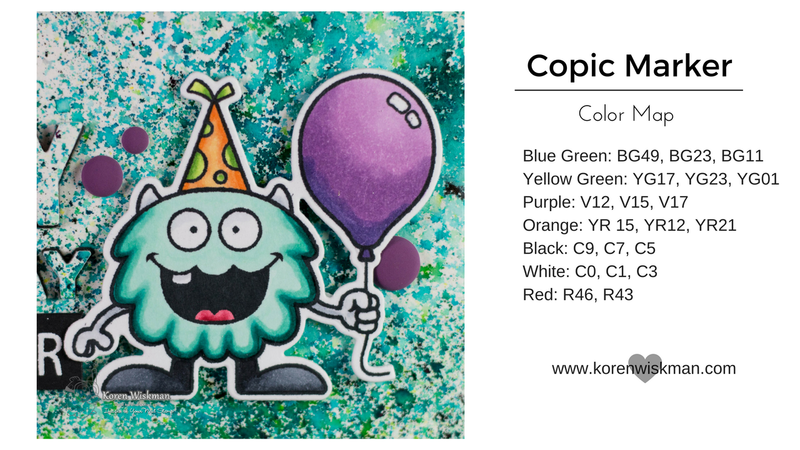 My first card uses Silly Birthday Monsters and Happy Birthday Word Die Set. I started with a background I created a few weeks ago using Ken Oliver Color Burst. It is a watercolor powder that activates when exposed to water. I placed some on a dry piece of Canson XL watercolor paper and sprayed it from above with a Ranger Mister. I cut it down using a Stitched Rectangle die from Your Next Stamp. I cut out the smaller Happy Birthday from the word die set, directly from the background. I used and inlaid die cutting technique to pop up the word using black craft foam. 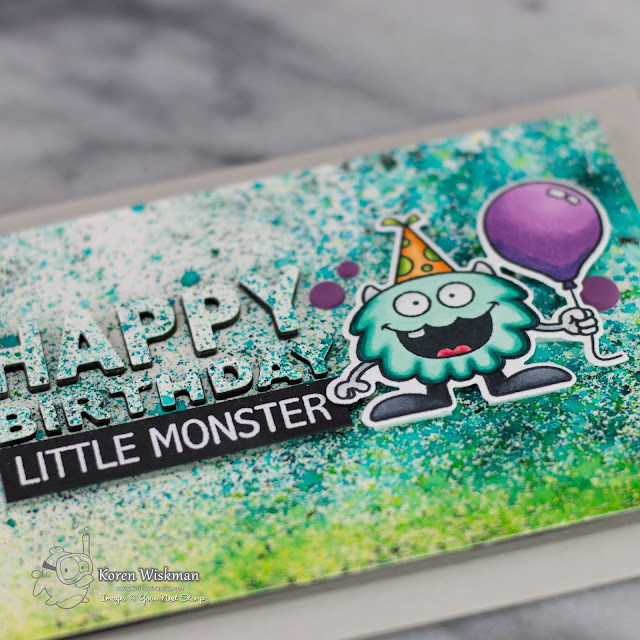 the "little monsters" sentiment on black cardstock and popped it up with foam tape as well. As a final touch, I used the brand new Pretty Peacock Gumdrops to add a bit more purple into the project. I'm really happy with the way it turned out. 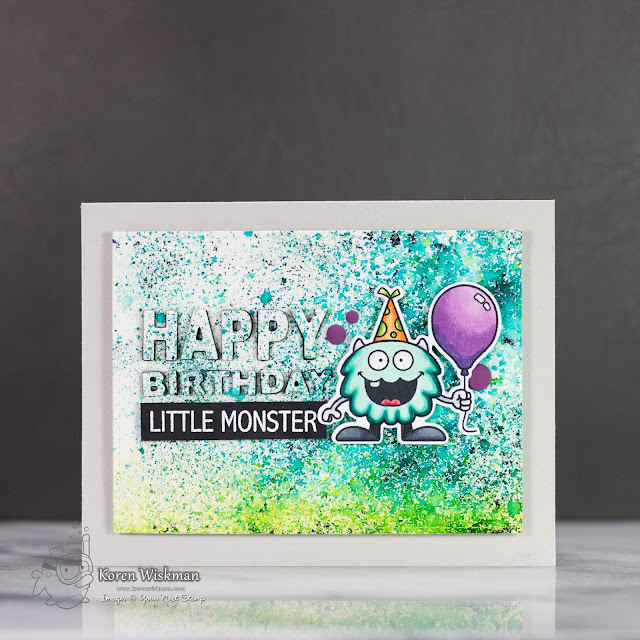 The background is so fun and these images from the Silly Birthday Monsters Stamp Set are to die for. For info on my second project, photos of both cards, a link to my YouTube video, and links to all of the products used, (except brand new releases), continue reading! My second card today uses the new Birdie Banners stamp set and the Party Dress Die Set, along with the fabulous new scalloped rectangle die set. I started with a Simon Says Stamp Fog card base. I used the largest of the scalloped rectangle dies to cut out my front panel in a light pink cardstock. This is Pixie by Avery Elle, which is discontinued. I stamped my images in Memento Tuxedo Black ink on Neenah 80 lb. Solar White cardstock and I did very simple Copic coloring. The Party Dress was cut from Bazill White cardstock that is textured. The dress and the bow from the set was popped up with foam tape. I finished it off with some Duck Egg Blue Nuvo Crystal drops. Thank you so much for visiting my blog today, please make sure you hop along with us and comment along the way for your chance to win! Such different styles and both are charming! I love both of these! thanks for the video! I just love the 2 very different looks of your cards. One sweet and lovely, the other vibrant and fun! Terrific job featuring the new products! Sweet cards! I love the background you created for the 1st card! And the dress is just adorable! Cute birthday card with monster. oh wow... the monster... awesome! The dress...so so sweet! Brilliant cards Koren. I love your background the cutie patootie monster and word dies. I enjoyed your video with lot of fun! Both of your creations are fabulous! Thanks for the video tutorial! Love the sweet little dress card. Both cards are gorgeous in their own way. The monster card is fun & bright & happy. And the congrats card is simply stunning. The background on your first card is WOW! Love your sweet dress card too! Both cards are simply adorable Koren, the dress is precious! What a great background on your first card!! And the dress looks so sweet with the bow. Great release!! I love the background on your first card.. so cool... and your #2 card is gorgeous too! Your monster's background is a perfect match for him! OMGosh these are all so adorable, love the background you made. Two totally different cards. I love them both. Thanks for including the video. Koren, both of your cards are really gorgeous! The copic work of your little monster is amazing, and the card with the dress is so elegant! Very pretty style! Love the splattering on the first card. Thanks for including the video showing how it was made. I'll have to check out the video about making the splatter background. Oh my stars I LOVE your monster card! That sweet little dress is just awesome as well. Thanks so much for sharing with all of us! Wonderful cards! Love the Color Burst messy background and your video. One card so inky and the other so CAS....both are fabulous! I do love YNS happy monsters. Your card brings a smile. That white dress really caught my eye. So simple, yet so pretty! Love the cards! I really like these little monsters and the dress card is so sweet. Great designs! Thanks for the inspiration! I can see why you are addicted to the color burst! Your cards are both beautiful. I really like the 1st one with the color burst background and love how you raised the sentiment with the foam. Really cute! Great cards! I love the little monster. LOL Great colors. I absolutely adore that monster card! ❤️ love ❤️ love the splatter effect! And those monsters stamps are awesome! That background is amazing and I love that sweet little dress! What a fun background for your monster! Love how sweet the new dress die is. Such a darling card! Thanks for the inspirational video on the fun Monster, and the texture on that dress is to die for. Great job. Cute and colorful monster card and beautiful dress card. Both cards are adorable. Love the splattered BG of the first. Both of your cards are wonderful and I love the way you speckled your background and the die cut letter on the monster card. So fun! Your inspiration cards are great! Love the monsters and the cute little dress die! LOVE LOVE LOVE the color burst background! Both cards are amazing! Your color burst background was just awesome and the video was a great added bonus! Loved both of your cards, thanks for sharing. Fabulous cards! Your first one is so colorful and fun, and the second one is as sweet as can be! Great variety! The moster is so vibrant, and the dress is so sweet. Thanks for the inspiration. love your colors on your first card, the second is beautiful in pink!!! great job!! Gotta love Silly Monsters!! The originals are still one of my favorite YNS sets! Your card is adorable and that background is awesome!! 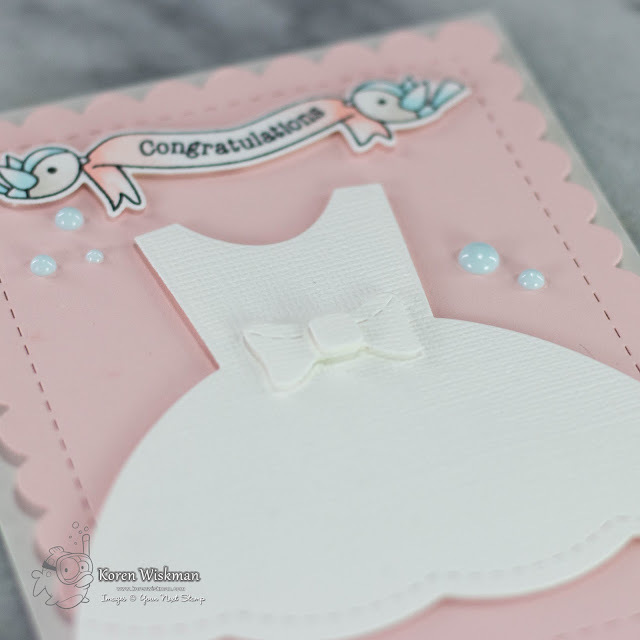 and your little dress card is just too sweet! Gorgeous cards! Love the background on your monster card! I'm resisting the monsters because I could also get addicted to them. Thanks for sharing. Stunning cards, that dress is gorgeous. Oh my!!! Both your cards are absolutely cute!!! I'm in love for the stunning background of the first one!!! The background on the first is so creative and the sweet dress die is great on the last. Wow the Monsters look Amazing. Love the Dress one too!